Cutts Close Park is the largest park in Oakham and used to be the ponds and garden area of Oakham Castle. It’s a heritage site, in the centre of which is a bandstand. After the Queen’s jubilee in 2012, it was renamed Queen Elizabeth II Diamond Jubilee Bandstand. The flowers around it are tended by Oakham’s very own Oakham in Bloom. There is ample parking nearby and areas of recreation for people of all ages. There are swings and a play area for small children. As well as this, there is a Skate Park for skaters, BMXers and rollerbladers. Events, particularly in the summer months, take place here, including dog events, local carnivals and funfairs. 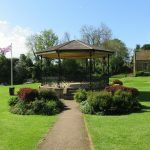 It is the ideal spot for a picnic, especially when live music is playing at the bandstand. Nearby landmarks include Oakham Castle, All Saints Church and the buttercross.